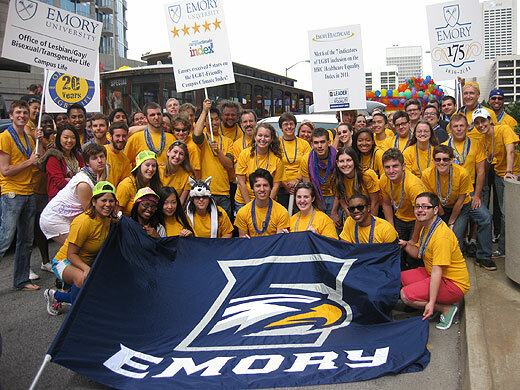 Emory students, staff and faculty participate in the Atlanta Pride parade. Emory is the "most LBGTQ-friendly school" in Georgia, according to a review from eCollegeFinder, a website dedicated to matching colleges and prospective students. The website chose the most supportive school for LGBT issues in each state, based on information from several different sources, including Campus Pride, Princeton Review and Advocate, among others. "These colleges and universities serve as prime examples for schools making a difference in LGBTQ students' lives, through their clubs, events, programs, housing, support centers, and/or overall campus environment attitudes," eCollegeFinder noted. One of the reasons Emory made the list is because of the university's long history of providing support to the LGBT community, Danielle Steel, interim director of Emory's Office of Lesbian, Gay, Bisexual and Transgender Life, said in an Aug. 12 interview with WABE. "We're going beyond some of those basics and talking about how it's much more complex ... Students hold so many different identities – more than just revolving around their sexual orientation or their gender identity or expression," Steele said in the same interview. In 2014, Campus Pride named Emory to its list of Top 50 LGBT-Friendly Colleges and Universities. Emory was the only university in Georgia and among only three colleges and universities in the southeastern U.S. to be included in the Top 50.